The Yarra Valley is a must visit destination due to its large number of wineries, super restaurants, wildlife and national parks and also its closeness to Melbourne. It’s a perfect spot to enjoy and experience the great pleasures of good food and wine along with picturesque surroundings and inspiring art. One of the best ways to experience the entire Yarra Valley is to take the hot air balloon ride at dawn over the assorted fields and vineyards and then unwind with some fine wine and good food at a selection of world class wineries. I shared this fantastic experience with my partner and it will always remain one of my favorites. The entire adventure was magical with a tinge of romance and is one of my most recommended tours to take. 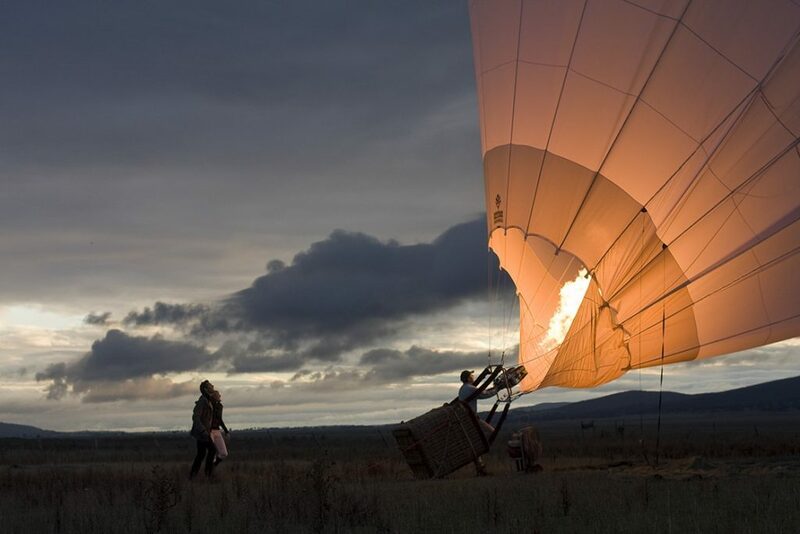 A hot air balloon ride at dawn means an early start for you and is worth the effort. The panoramic view of the vineyards, farms and forests is breathtaking and is sure to be a special memory that you will always cherish. It is advisable to wear comfortable clothes and carry a jacket for the ride. Also, jeans or pants for women will be more appropriate and convenient attire as compared to skirts or dresses as the weather is often windy. The day starts at around 3.00 AM, when we first called the ballooning company and confirmed the balloon ride was on schedule as per the weather conditions. We were then picked up from our hotel and taken to the launch site. To ensure the hot air balloon ride starts on time, we were all asked to help the crew prepare the balloon, which in itself was a fun filled experience and gave us an insight into how a hot air balloon actually operates. The crew spoke to us and explained all the necessary precautions to be taken and so the ride was extremely safe and secure. As the balloon was inflated and the wicker basket stood erect, we only had a few minutes to quickly jump into the basket before it took off. The sky was clear and our take off was smooth and pleasant with no bumps. The higher we went the more magical and peaceful we felt. Sunrise has never looked and felt this amazing and breathtaking. The view of the beautiful patchwork of wineries is stunningly spectacular. The balloon was somehow made to revolve so that everyone got a complete 360 degree view.The landing too, was safe and smooth without any rocking and swaying. On landing, it was good fun to help pack away the balloon once it was deflated. This impressive balloon ride was followed by a lavish and filling breakfast with lots of champagne. Ballooning over the Yarra Valley is an unforgettable experience and one that I can’t wait to do again. This is one of my most recommended outdoor activities to do in Melbourne. It is apt for families and couples and also children above the age of 7 years. The entire experience takes about 4-5 hours and is priced at $395 per adult and $300 per child which includes the ballooning ride and the breakfast.